Quantitative susceptibility mapping (QSM) is a novel technique which allows determining the bulk magnetic susceptibility distribution of tissue in vivo from gradient echo magnetic resonance (MR) phase images. Our purpose was to evaluate if there is additional diagnostic value of QSM images in detecting the cortical gray matter involvement in multiple sclerosis (MS) patients. Our institutional review board approved this study. Conventional MR imaging, including T2-weighted imaging and two- or three-dimensional fluid-attenuated inversion recovery images, and QSM imaging examinations were performed in 27 patients (19 male and eight female) with MS. Two radiologists (radiologists 1 and 2) assessed the MS lesions in the following 3 anatomic regions: intracortical, mixed white matter–gray matter (WM–GM), and juxtacortical regions. 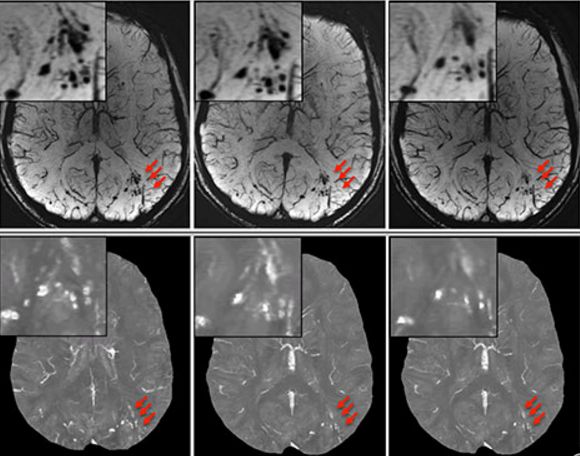 The numbers of lesions per region category were compared between conventional MR images with and without QSM images. For radiologists 1 and 2, QSM images identified 6 (50.0%) and 7 (50.0%) additional lesions that were not seen in the conventional MR images, respectively. In a lesion-by-lesion analysis, the substantial fraction (20 [25.3%] of 79 at radiologist 1, 22 [29.7%] of 74 at radiologist 2) of juxtacortical white matter lesions on the conventional MR images were scored as mixed WM–GM lesions with QSM images. Our preliminary results suggest that the MR imaging with QSM may increase the sensitivity in cortical lesion detection in the MS brain and improved distinction between juxtacortical and mixed WM–GM lesions.